Sometimes you need to take money out of a traditional IRA earlier than you thought you would. This type of withdrawal will be taxed, and may also be subject to an early withdrawal penalty tax. Of course, like most IRS rules there are penalty taxes, and there are exceptions to those taxes. You can qualify for an exemption from the IRA penalty tax if you used your IRA early withdrawal to pay medical expenses that are more than 10% of your adjusted gross income. You received unemployment compensation paid under federal or state law for 12 consecutive weeks because you lost your job. You receive the IRA withdrawal during either the year you received the unemployment compensation or the following year. If you have since been re-employed, you cannot have received your IRA withdrawal more than 60 days after your new employment started. You are considered disabled if you can furnish proof that you cannot do any substantial gainful activity because of your physical or mental condition. A physician must determine that your condition can be expected to result in death or to be of long, continued, and indefinite duration. If you inherit an IRA from a non-spouse, even if the IRA owner was under age 59 1/2, you will not have to pay the penalty tax on amounts withdrawn. You will still have to include any IRA withdrawal in your adjusted gross income. If you inherit an IRA from a spouse, and you choose to treat it as your own IRA, then any IRA early withdrawal you receive will be subject to the 10% penalty tax. If you inherit an IRA from a spouse, but you choose to title the IRA as an "inherited IRA," then you would be eligible to receive IRA early withdrawals without paying the 10% penalty tax. Created by Internal Revenue Code Section 72(t), the Substantially Equal Periodic Payment (SEPP) rule lets account holders withdraw money from their retirement accounts at any age, penalty-free. You must follow certain rules and use an approved method to calculate an ongoing withdrawal amount. There are three IRS-approved methods for calculating the amount of your SEPP withdrawal. You must stick with your withdrawal schedule for a minimum of five years, or until you reach age 59 1/2 (whichever event occurs later), or all amounts withdrawn may become subject to the penalty tax. IRA early withdrawals used to pay qualified higher education expenses on behalf of you, your spouse, or the children or grandchildren of you or your spouse, are exempt from the 10% penalty tax if they were paid to an eligible educational institution. 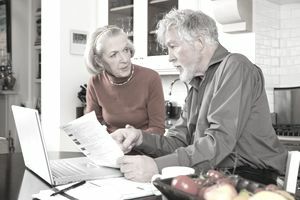 Up to $10,000 of an IRA early withdrawal that is used to buy, build, or rebuild a first home for an ancestor (parent or grandparent), yourself, a spouse, or you or your spouse's child, or grandchild, may be exempt from the 10% penalty tax if you meet the IRS definition of a first-time home buyer. If both you and your spouse qualify as first-time home buyers, then each of you could withdraw $10,000 from each of your respective IRAs without paying the 10% penalty tax. The distribution must be used to pay qualified acquisition costs (which includes reasonable closing costs) before the close of the 120th day after the day you received it. A qualified reservist distribution is not subject to the penalty tax on IRA early withdrawals. You were ordered or called to active duty after September 11, 2001. You were ordered or called to active duty for a period of more than 179 days or for an indefinite period because you are a member of a reserve component. The distribution is from an IRA or from amounts attributable to elective deferrals under a section 401(k) or 403(b) plan or a similar arrangement. The distribution was made no earlier than the date of the order or call to active duty and no later than the close of the active duty period. The rules outlined in this article come from the online IRS Publication 590, where you can find additional information on IRA penalty exceptions.